This is the current page, posts from 11/15/18 through today. The city is having its annual bulky item pickup this month and I found some desk drawers along the side of the road that looked too good to go to the dump. At the shop, we removed the pulls and put them in the hardware box. 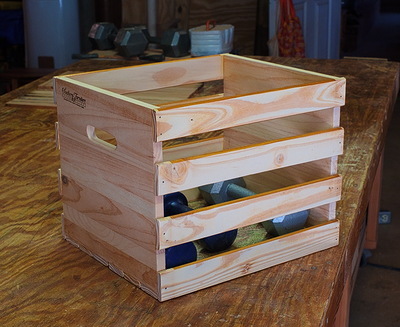 Later, Joe broke down the drawers into constituent pieces, from which he built the pictured crate. 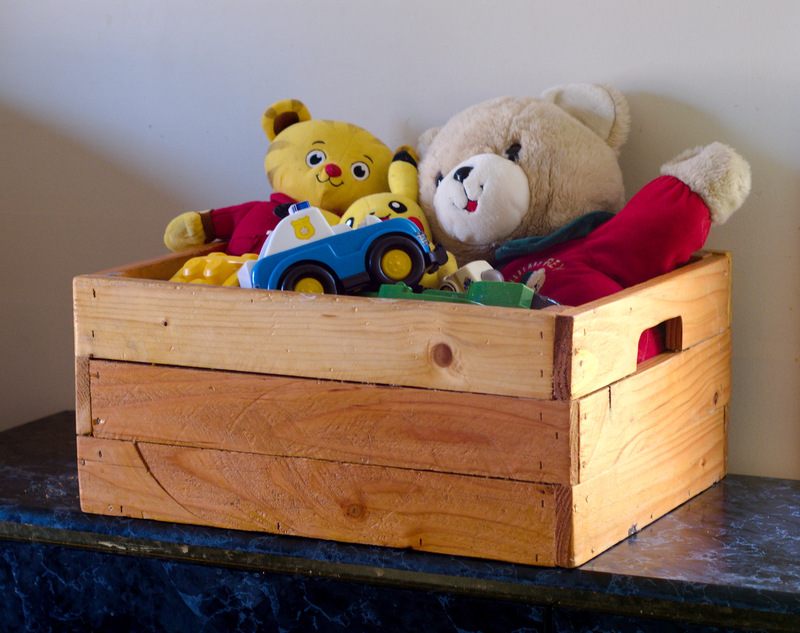 Here is a photo of the toy box that we made a couple of months ago and the joy it has brought. This truly makes the effort worthwhile. 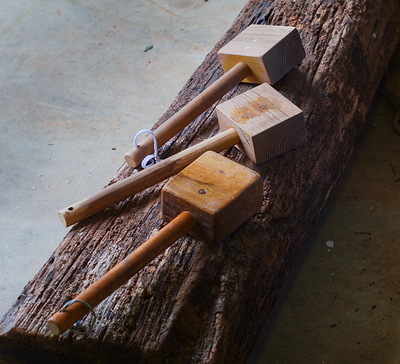 When we first started the shop, we made three wooden mallets. The first was Thor, the second was Junior, and the third never acquired a name. In my opinion, Junior is the optimal shop mallet configuration. Since we have copious supplies of locust, an ideal wood for making tools, we decided to make a couple more mallets patterned on Junior. While Junior has a white oak head, the new ones have locust, and all have maple handles. So here we have a picture of Junior, Junior II and Junior III. One of the new ones will go to our friend Mark, who has endowed us with much good salvage wood, including the locust. Now and then I like to check up on things that came out of the shop. This toy box is one that Joe made for Lars a while back. 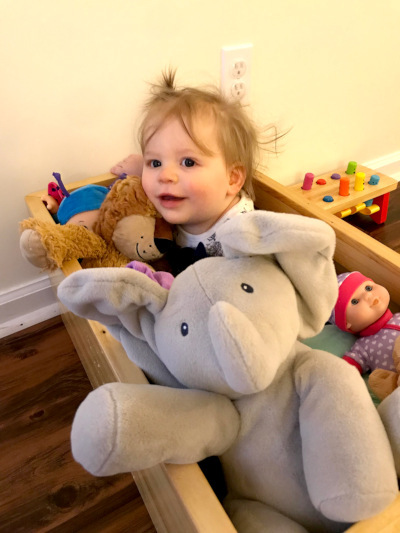 When it's not full of toys, Lars likes to push Lex around the house in it. 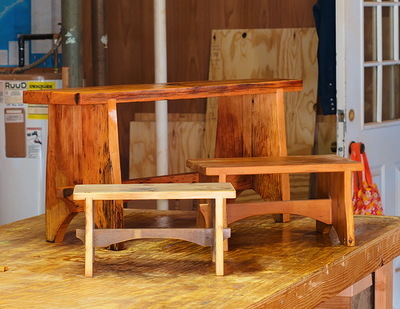 A couple of step-stools in front of the heart pine bench show the basic design relationship. I drew the initial design to allow for a quick, simple step-stool to be built from 3 linear feet of construction grade 1x12. 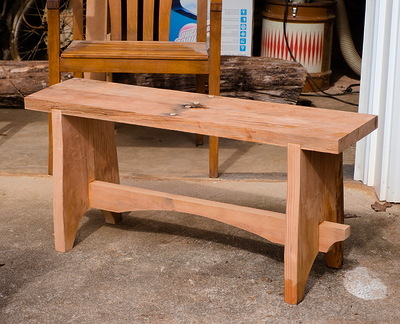 It is very similar to a Sellers Bench, but lower, smaller, proportionally wider, with a dropped stringer. Since the first two, from February 2016, we have built them in several sizes and woods, and now scaled up as a bench. First project with the heart pine that we saved off Mark's burn pile. 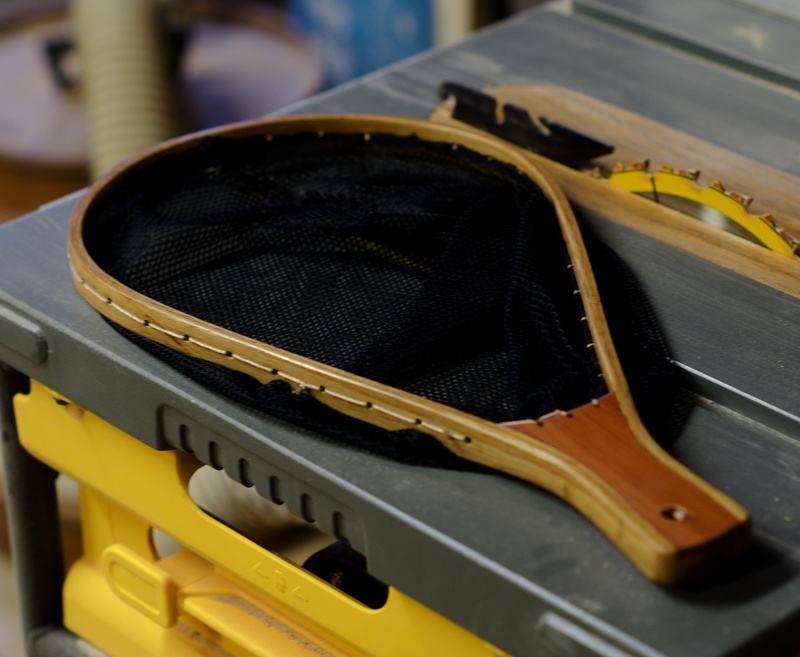 It's glued up and ready to sand and finish. We don't often get a chance to work with this kind of heavy stock, 1 1/2 inches thick. A friend offered us some old planks that he had obtained years ago for a project that went by the wayside. I took an offcut to the shop for us to examine. We found the wood to be heart pine, in good condition. Heart pine is the slow-growing heartwood of longleaf pine. All the old stock has been harvested, so no more is coming to market. The only sources are salvage and dredging up old logs from the bottom of rivers. I told Mark we would take whatever he wanted to give us. He was getting ready to put it on his burn pile and was willing for us to take it all. 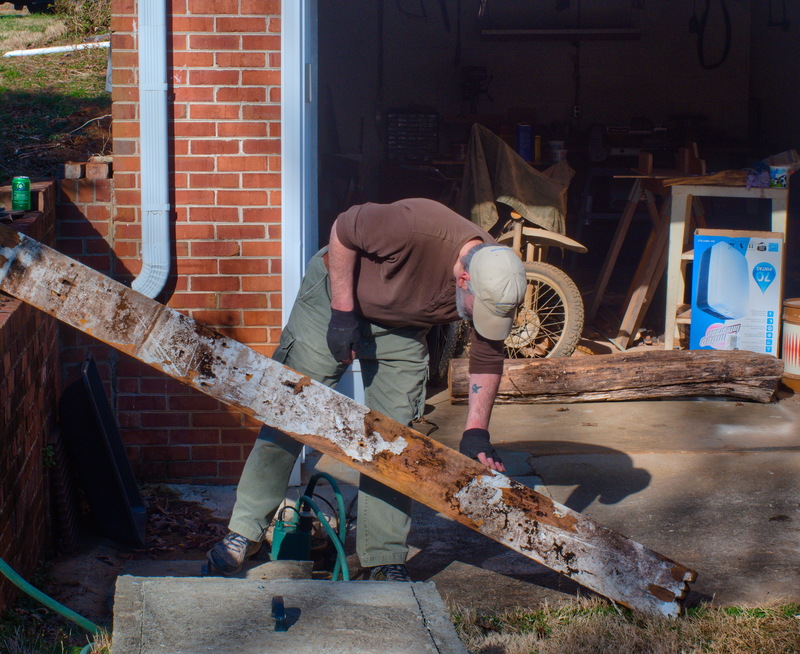 We ended up with several good planks, six to eight feet long, nominal 2x8 and 2x6. All had nails, but they were in regular patterns and easy to find. Most of the nails were corroded and loose. We cleaned the nails out of a couple of planks and will get to the others as time allows. It's not often that we get our hands on this kind of heavy stock. A lot of it will get milled down for boxes, but we hope to use some to build a substantial trestle bench modeled on the step-stools we have been building, scaled-up and lengthened. Along with the pine we brought home another large chunk of locust. That made a truckload. There is more locust that we will get later, a couple of big logs. We will probably try to split it into halves or quarters on the spot as it is almost too heavy to move. Today we delivered a set of shelves to our friend Dee. We never sell anything or charge for our work, but when someone offers us lunch we don't turn it down. Pastrami and Provolone on rye, toasted and spiced up with German mustard, with a cup of fresh-brewed strong coffee (I took mine with molasses and cream). Dee is one of the best cooks I know. She cares enough to take the time and effort to turn out something good, even just for a quick lunch. The first project we did in the woodshop, back in September 2013, was a set of shelves for Marie's room, back when she lived at my house. Since then, we built her another to go in the house she and her husband Levi bought after they got married. We built one for Levi's sister, Sally, and maybe another one or two others. We have built so many of these bookshelves that we're getting really fast at them. This one took less than three hours, if you don't include the time spent picking up the wood from Home Depot. This is just the kind of thing we wanted to make when we started the woodshop - solid, simple, inexpensive furniture for friends and family. I'm glad we have been able to stick to this vision, with the worthwhile addition of making lots of things for the firemen's and burn survivors' groups to auction to raise money for their projects. A friend was getting ready to burn a pile of old 2 x 8s in his backyard and told us we could have them if they were of any use for woodworking. I took a piece back to the shop and we milled it into 1 1/2 x 3/8 inch slats. It was heart pine in excellent shape. I emailed him and asked him to keep it back from the burn pile and we would take it all. He also had a few old trunks of yellow locust that had lain around a neighbor's yard for years, then around his yard, which he offered to us. I took a section home to see if we could work it. First we split it down into quarters and then we flattened two sides of a quarter with a plane, enough to get it to ride through the table saw without wobbling. We milled out a 1 1/4 x 1 3/8 inch stick that I will use to build some cleats for my boat. 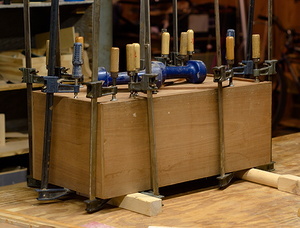 We will probably mill some slats and also some blocks for mallet heads. We will also try turning it. If we can cut it on the lathe, it would make excellent tool handles and dowels. Like the pine planks, I asked him to hold on to all of it for us. Even though we don't sell anything, (we give things to friends and to charity sales) we still call it payday when we have several things to finish at once. 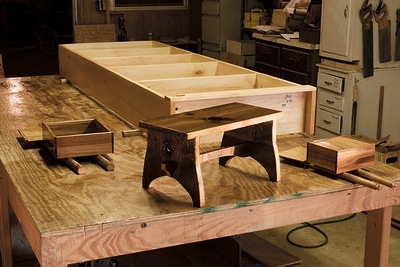 Today we brushed polyurethane on two slide-top boxes, a step-stool and a set of shelves. The shelves are for our friend Dee. She once gave us a beautiful old-growth yellow pine board. We won't forget that generous and perceptive act. The step-stool is for Marcia's grand-daughters, so they can reach the top shelf in the bathroom. The slide-top boxes will go to a charity sale, perhaps. In the background, behind the steady stream of boxes, crates and totes, we usually have a major project. 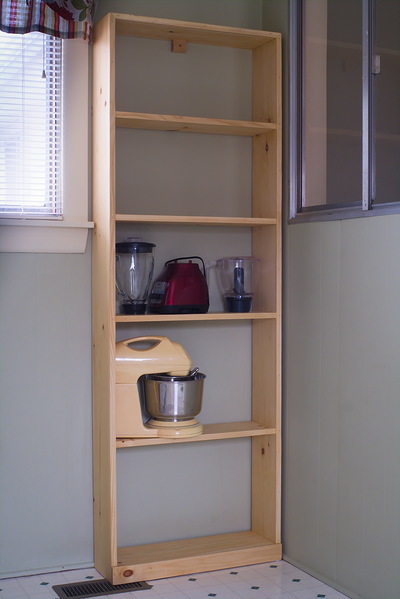 Last October we started on a kitchen hutch for Marie. The base is coming along, and then we will build a set of shelves to go on top. It is in cherry, mortise and tenons with floating panels. The cherry is easy to work. It's not surprising that it has been a favorite wood for American furniture makers for many years. This is a complex, difficult project for us, and it is taking a lot of time. Today we managed to glue up the case and get the lower shelf installed, which feels like a real breakthrough. I told Joe we should have it finished by Christmas. I hope we finish it long before then. Another look at Joe's mahogany box. 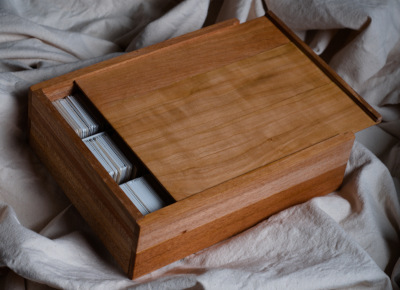 This box is something Joe has been working on for quite a while, and as of today it is finished - although he will rub a coat or two of wax on it once the polyurethane finish is thoroughly cured. It is made of mahogany that he found - free - on craisgslist. 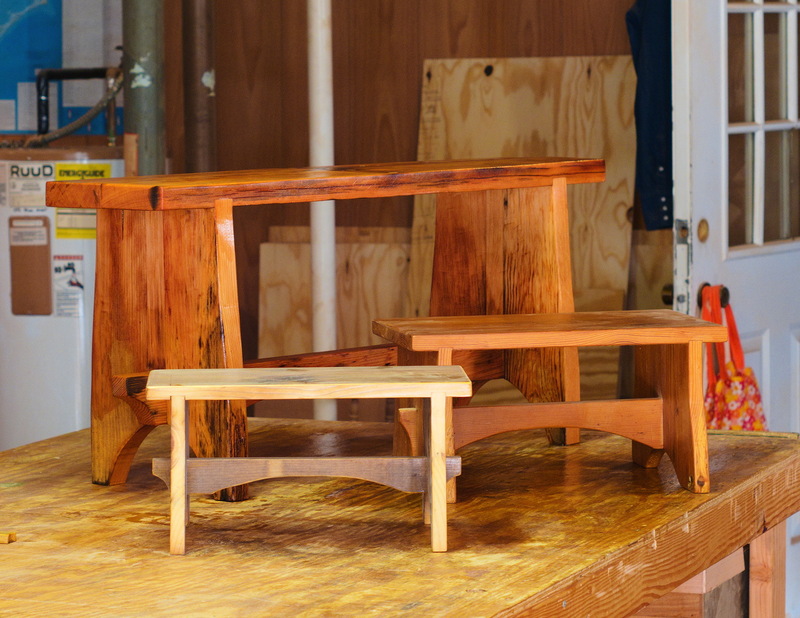 The top design is laminated mahogany and maple on a mahogany base. He plans to donate it for sale or auction to benefit the firefighters through his burn survivor group. A lot of work out of the shop goes there. I have many albums of prints that were taken by my friend Gordon Burgess. The pictures document the work of Piedmont Appalachian Trail Hikers maintaining the Appalachian Trail in southwest Virginia. I have posted scans of hundreds of these pictures in an ongoing project to preserve the images and the club history they document. As far as I can determine, Gordon shot mostly Kodacolor, but he would have slides made from some of the negatives and present slide shows at club events. The slides were all stored in Kodak Carousel rotary trays. I think the days of slide shows have passed, since digitized images can easily be displayed on big-screen TVs and monitors. The trays are bulky and hard to store, so I decided to pass them on to Goodwill. Perhaps an antiquarian or Luddite photographer might find them there and get some use from them. 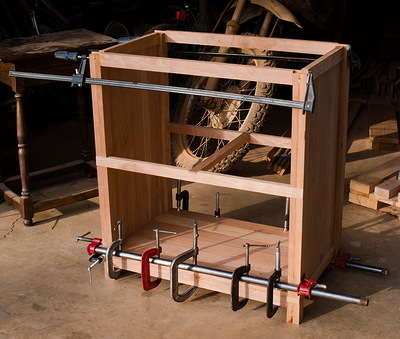 I'm not quite ready to throw away the slides, so Joe and I built a slide-top box to hold them for long-term storage. 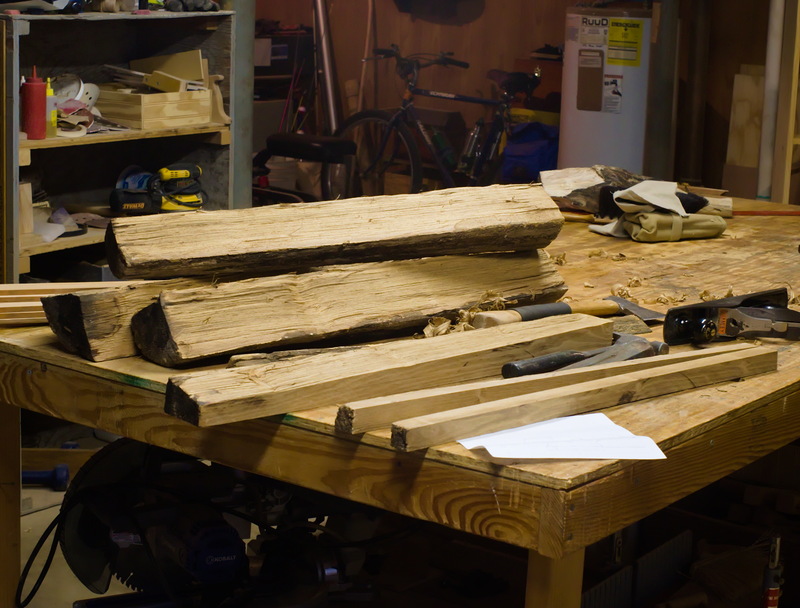 We had some nice cherry off-cuts, scraps and resaws from a project. We used them to cut out and glue up parts for two standard 8x10 slide-top boxes. When we were done, we found that we had enough left over to build another box of about 4x6 inches out of second-order scrap. What was left we threw in the fire so we didn't get stuck in an endless recursive loop of building smaller and smaller boxes. 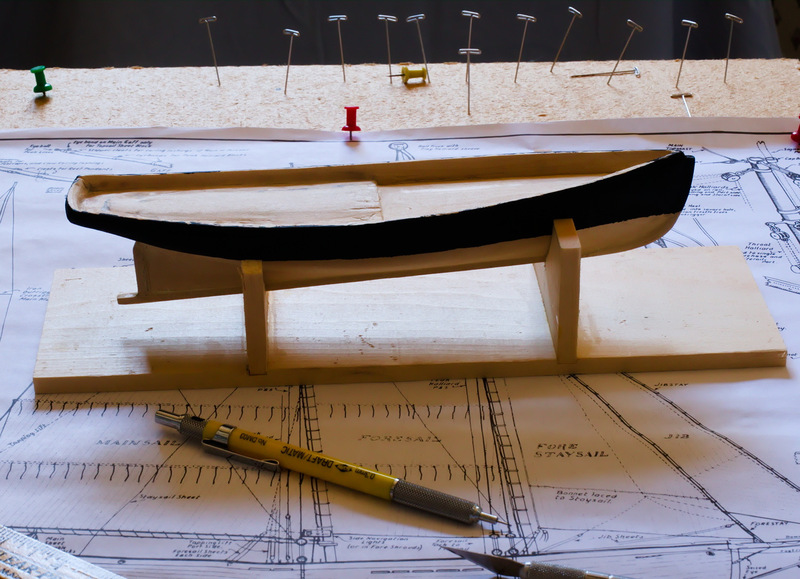 I'm working on a side project at home, a model of a New York pilot cutter from the 1870s. I started it years ago but quickly decided I was in over my head and set it aside. After working in the woodshop for several years I felt I had built up enough skills and confidence to proceed, so I got it back out and resumed work. So far it is going good. The hull is almost finished and the next step will be the deck houses and fittings, then on to the masts and rigging. While much of the hull work is best done with the model in hand, the later steps are easier with the boat right side up in a cradle. So we built one at the shop out of scrap wood. Once the model is finished we will build a permanent stand out of some nicer stock. Joe built this laminated fishing net for his occasional trout-fishing trip on the Watauga River near Boone. It is very similar to one I built at Dale's shop 40 years ago. Here are a couple of projects that I have completed for some friends. 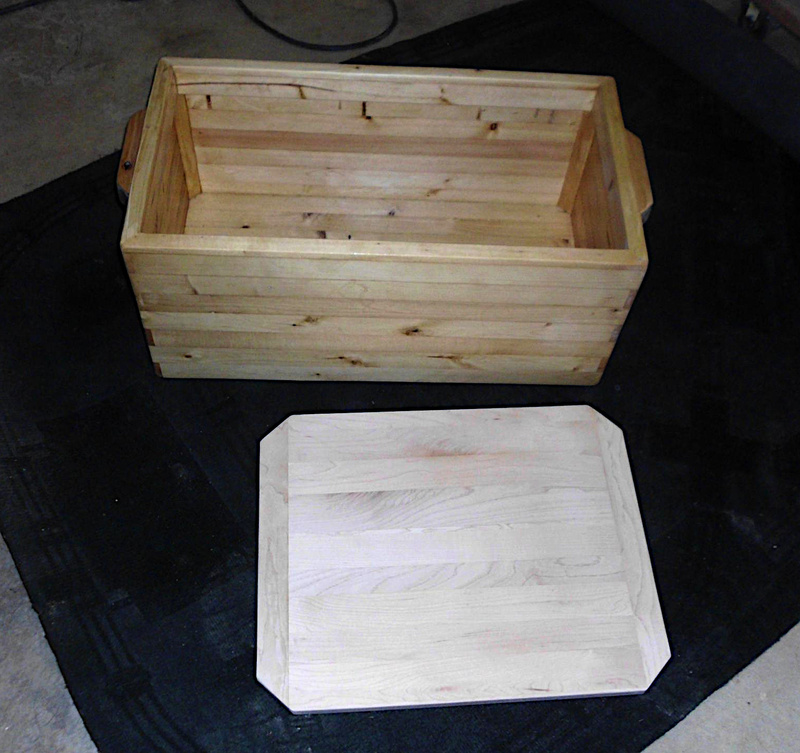 The maple cutting board is for D'Ann, the ends are tongue and groove so to stave off splitting, and the pine toy box is for Liz's new baby daughter. I used the stacked alternating corner method that we have had so much success with and there is no top to pinch fingers. I welcome requests sometimes as I lack inspiration frequently. This simple, small box came out nicely. We fitted the hardware and rubbed on a final coat of finish today. It will probably go to one of the charity auctions next year. 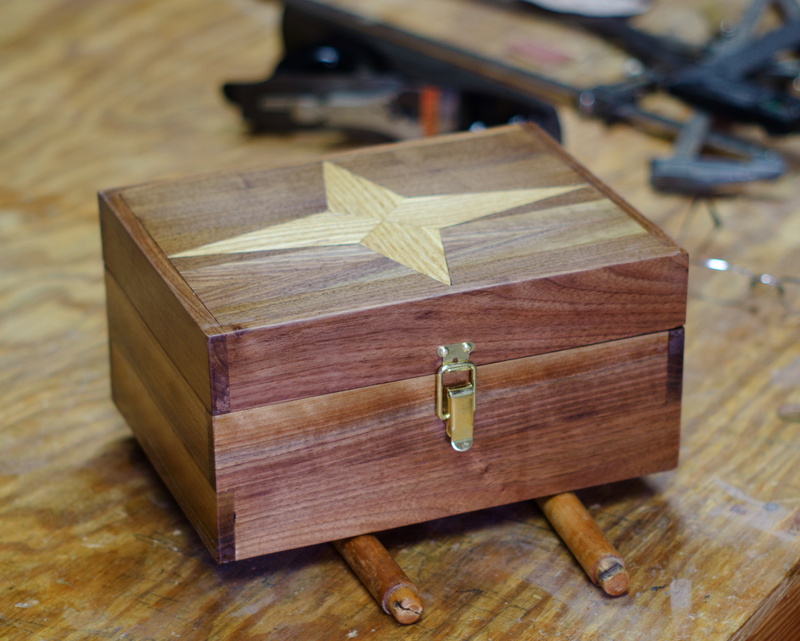 This box is one of Joe's projects, though I had the pleasure of helping with it today. It is made of mahogany that Joe found on Craigslist, free from a man who had some left over from a project. Now, a lot of things are called mahogany these days, very few of which are the traditional Cuban or Honduran mahogany, the furniture wood of choice in America and England during the Colonial period heyday of fine furniture. Cuban and Honduran mahogany are endangered species that are almost unobtainable these days. Sapele, Luaun, Utile, all are marketed as mahogany. The closest thing to traditional mahogany is African mahogany, which is in the same genus and has many of the same characteristics. 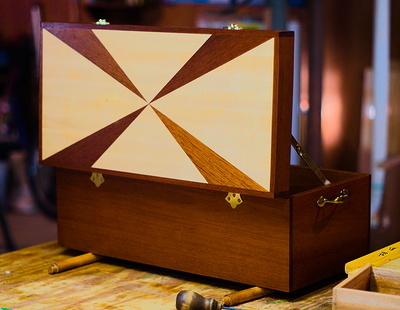 My guess is that this box is made from African mahogany. This wood is beautiful, with attractive grain and color, and is very easily worked. We are lucky to have a chance to use it, since it is under heavy pressure itself, and will probably become endangered in our lifetimes. 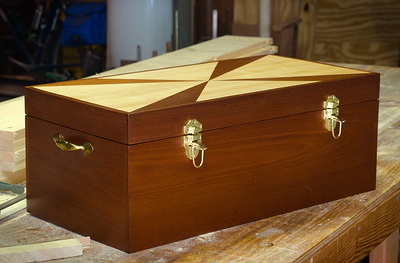 This box is getting an inlaid top with ash as the light wood. Joe had completed constructing the bottom and sides as well as the sub-base for the top. Today we started cutting and glueing the inlays onto the base.